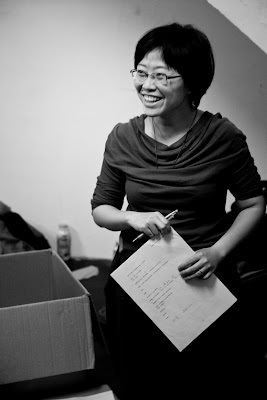 As a composer, Kueiju Lin enjoys working with acoustic and electroacoustic instruments, sound installations and interdisciplinary collaborations in both theater and dance. She is also an improviser on piano. Her debut album “Classy Bluster - Improvised Music by Kueiju and Friends” is released in December 2010. She holds a Bachelor degree in Composition from the Taipei National University of the Arts and a PhD. in Composition from University of California, San Diego. She has collaborated with Taiwan’s Guo-Guang Opera Company, Taiwan Bangzi Company, M.O.V.E. Theatre Group, Mobius Strit Theatre, Dance Forum, Scarecrow Contemporary Dance Company, theater director Xiao-Ping Lee, Hong-Zheng Fu, choreographer I-Fen Tung, amongst others. In 2009, she was the artist-in-residence in Perth, Australiz, sponsored by the Taipei Art Village, and exhibited her sound installation “listenning to the darkness” (in collaboration with Chris Tonkin) in the Totally Huge New Music Festival. In additions to her involvement in collaborative projects, she has received commissions from La Jolla Symphony and Chrous (U.S.A), Nouvel Ensemble Moderne (Canada), Forum Percussion Ensemble (Taiwan), amongst others. Her music has been performed in concerts and music festivals in Taiwan, Japan, Korea, Israel, Australia, France, Poland, Canada and across the USA. She is currently the music director of the M.O.V.E. Theater Group (Taipei), the founder of MeiMei Co-op and an adjunct assistant professor at the Taipei Municipal University of Education and the Fu-Jen Catholic University.